Lake Toba is the largest and deepest lake in the world, located in a volcanic caldera. This huge basin, in the middle of which lies the mysterious island of Samosir is located in the bare mountains of the northern Indonesian region of Sumatra. 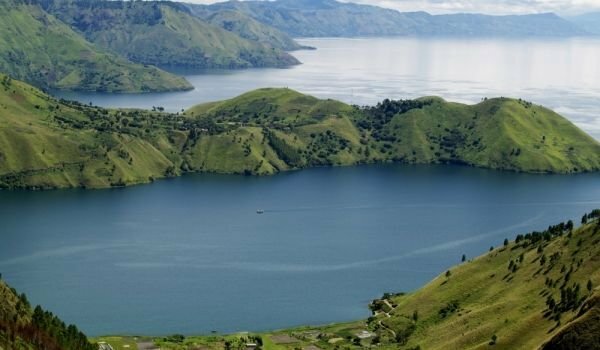 Lake Toba was formed about 74 000 years ago, following a volcanic eruption. Today its size reaches approximately a 1, 707 sq.km. area, and in places the depth is at 530 m. It is assumed that this is the largest active caldera in the world. According to some studies it may be a consequence of climate change thousands of years ago, which caused an ice age on our planet. Today tourism in the region is weaker than in previous years. Therefore, prices here are cheap, no crowds of visitors and it is a relatively quiet place to rest. Samosir Island is located in the middle of Lake Toba, it’s length reaches 45 km and width - 20 km. It is also known as "Isle of the Dead." The local population is represented by the Batak tribe, which nowadays are mostly Christians. In the central plateau, the island is 780 meters high above sea level. Towards the southern and western part of Samosir are most of the small local villages. On the west coast there is a bridge that starts at Pangururan and which connects the island to Sumatra. The houses here are very specific, almost each carries on its façade some generic symbol or character. All are made from wood, roofs are very high and highly inclined. The biggest tourist attraction which can be seen here are the Sarcophagi Toba Batak. Found in 30s of the last century, they are graves, which hold the remains of the entire genus or family. Some of them are more than 200 years old. The best way to reach Lake Toba, is to land at the local airport in Medan, then move overland to Parapat - the city which is located nearest to Lake Toba. The distance between the two cities is around 4 hours by car or, 6 hours by bus-from the intercity transport. The nicest time of year for tours is between June and September.